We’ve all heard the words, whether it be around campus or your parents warning you to watch your food intake before they said goodbye after dropping you off. The dreaded freshman 15, supposedly a byproduct of a lack of exercise on campus and a considerably less healthy diet (partially in thanks to the buffets in the dining halls). But another thing that you’ll hear is to be extremely wary of your alcohol intake, not only because it’s not allowed on campus but also because the calories really start to pile on. According to this article the average calorie count in a 12 oz container of beer is 153 and a shot of liquor is about 100. If you assume that the average person drinks 4 beers and a few mixed drinks at a party, that’s an extra 1000 calories just from drinking. Plugging these numbers into a calorie calculator (I used this one here) we can find that on average consuming an extra 3500 calories a week will equate to gaining 1 pound. I don’t think it’s super unreasonable to think that someone could be going out 3 nights a week, so if you don’t change your diet or exercise patterns you would be putting on 1 pound per week. 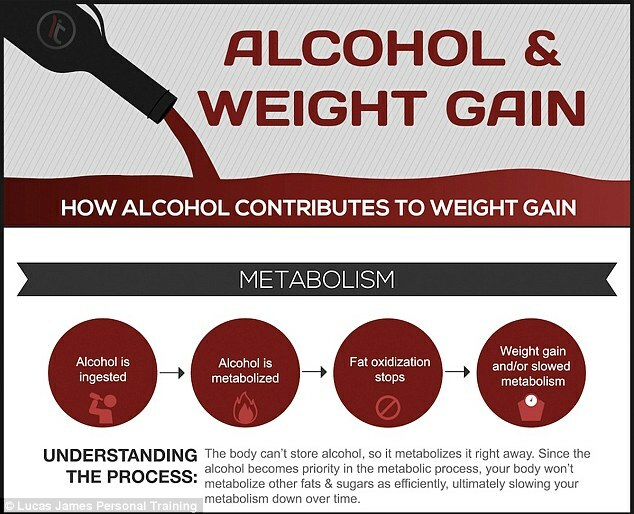 According to researchers, one of the main reasons that alcohol causes people to gain weight is because the body makes the decision to break down the alcohol first, so your metabolism doesn’t work nearly as fast for any solid foods that you have eaten. So if you go out for a piece of pizza after a late night party, your body is going to continue prioritizing breaking down alcohol instead of the pizza, and thus the pizza will be stored as fat. Additionally, there is believed to be a correlation that drinking alcohol, specifically drinks with a higher concentration, causes the body to produce more fat in the abdomen for men and the hips for women. 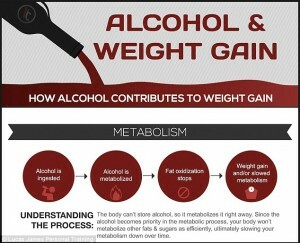 Another reason that alcohol can cause weight gain is because of the calorie content in alcohol. One gram has 7 calories, compared to 4 per gram in proteins and sugars. In fact, alcohol only has 2 calories less per gram then fats. Alcohol also causes the production of the hormone called Cortisol. As a result of higher levels of Cortisol, the body will begin to break down muscle and build less muscle after exercise. So you are drinking a lot of extra calories and your body isn’t able to build muscle. So what can you do about this? The simplest solution is a fairly obvious one, you could just not drink. But if you do choose to, watch what types of drinks you are having and then make smart choices with foods you eat during/after a party. Also, the walk to the forum for this class should help you keep the fat down. This entry was posted in Uncategorized on September 3, 2016 by Daniel J Lehecka. I was very interested to read about this production of cortisol and how its inhibits the body from producing muscle after a work out. I love the different ways the body works within itself. I starting looking into it, and trying to figure out what foods would be the best during/after parties so that people would be well aware of the best way to handle themselves. When it comes to decreasing the weight gain, here are a few extra tips!! This article really does have great information on health, however Ahmed is right. Penn State is one of the most well known school for a variety of reasons. We have amazing sports and academic programs as well as a lively social community. I doubt when someone accepts a beer or pours a shot they think of calorie intake. We’re not in high school anymore, I believe at this age we are becoming more accustomed to our schedules and limits. It’s really interesting how this isn’t something new I’ve heard and as a senior, I know alot of people are aware of this. Yet, the funniest part is that people still continue to drink. I have no problem with it and I don’t think people will completely change their drinking habits to accomodate for the calories. I’ve never heard of someone refuse a drink because the calories were too high. We all know how much Penn State is seen as a party school and I think if half the student body goes our three times a week like you said and has the amount of drinks you said, that’s about 6,500 pounds, which is insane! In conclusion, I think this just further proves the important of regular fitness and maintaining an active lifestyle which I think we do well. Penn State was ranked amongst the top of the most fit schools in the country. Which is probably in response to our weekend endeavors.